I'm excited to share with you today the work of Jon Siegel. Jon is an American expat based in Singapore. He works as a creative director for a digital agency by day. By night, he uses his camera to immortalize the streets of his adopted home. I spoke with him recently to discuss why he took up photography, the evolution of his style, and how he captures his subjects on the sly. When did you start taking photos? What drew you to photography? My dad is a professional photographer, so I grew up with a darkroom in my basement. Although my dad has always been one of my biggest inspirations in life, I never considered following his footsteps into photography. In college I gravitated towards graphic design, and only ever took photos if a design project necessitated it. 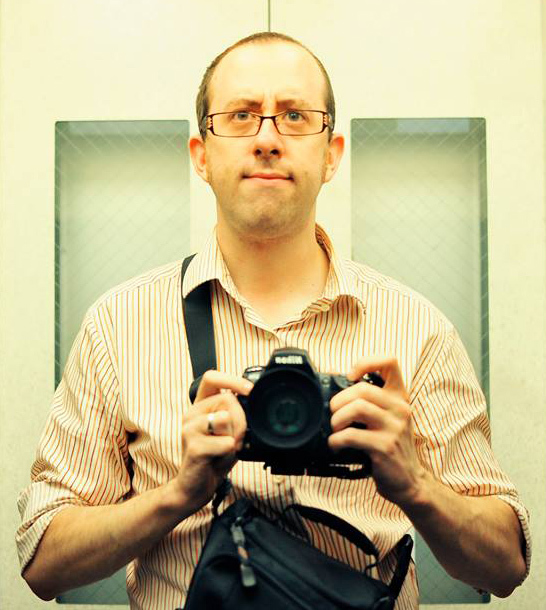 It was not until many years later, long after graduating college and moving to Tokyo, that it struck me that my travel photos were pretty awful. I had spent a good amount of time exploring Japan and Hong Kong, and seen some truly wonderful things, but I had a hard time expressing my feelings and thoughts about it all. I loved Jon Yongfook’s travel and food photography, and began to explore it and other people’s work on Flickr. I was so inspired by the way people recorded these amazing scenes, full of life and energy. So I gave my Dad a call and asked his advice on what camera to buy. He said not to get caught up in the specifications, to just pick up each camera in the shop and see what feels good. I ended up with the Nikon D80, which has a nice big rubber grip and a simple interface. That became my first “serious” camera, and my beloved travel partner. How do you come up with ideas for your subjects? Photography initially was a way for me to chronicle my travels, but it evolved into something else entirely. I grew up loving both film noir and Asian cinema. The latter was introduced to my by my childhood best friend who was from Taiwan. It was not just the fun and wild stories that drew me in, but their color, tone, energy and various styles of cinematography. 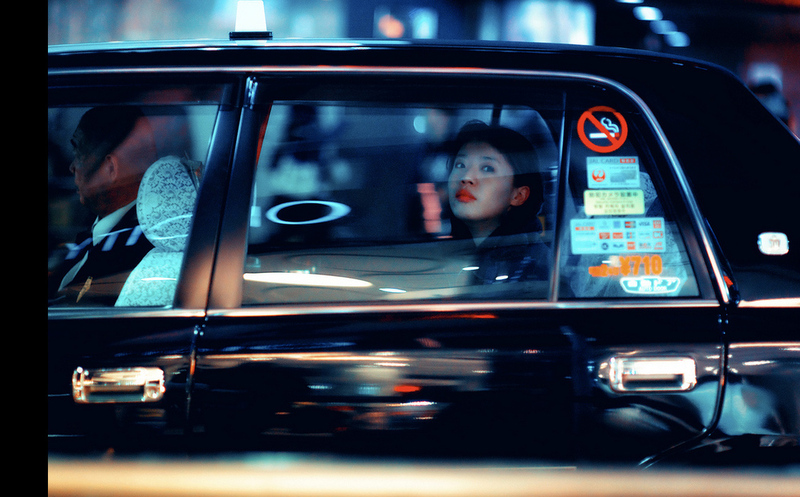 John Woo’s Hard Boiled, The Killer, and A Better Tomorrow; Wong Kar Wai’s Chungking Express, In the Mood for Love, and Fallen Angels; these films left such a strong mark on me. Watch them if you haven’t yet. They are magnificent and deeply inspiring. A few key scenes stand out for me: jazz music in the background, a beautiful woman at the bar counter sipping a cocktail, lit cigarette in one hand, bartender shaking another drink off to the side. The stylish man walking out of an alley on a rainy night, glowing city lights framing the shot. 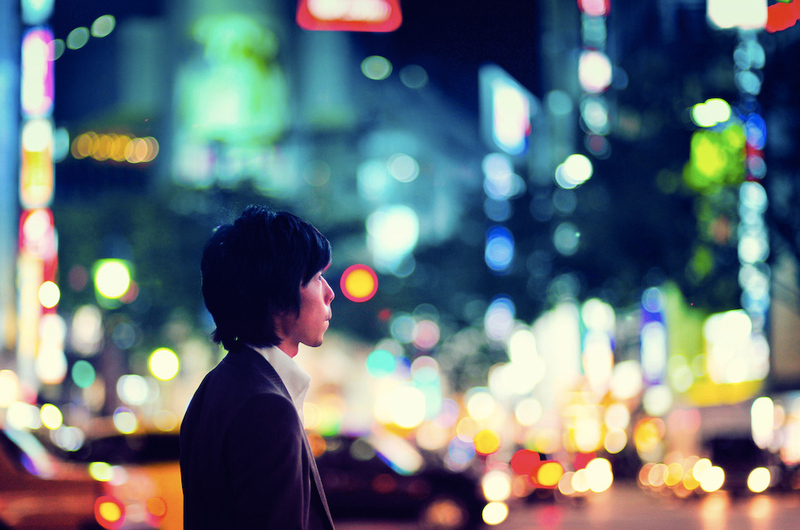 A person standing at the corner of a busy city street, colors and lights flashing around, watching people waiting, drifting in thought. Photography became a medium for me to tell these kinds of stories. It brought a new level of excitement to my life, as I began to weave a narrative through my work. My camera now serves as a door to my imagination; every shot tells a different tale. 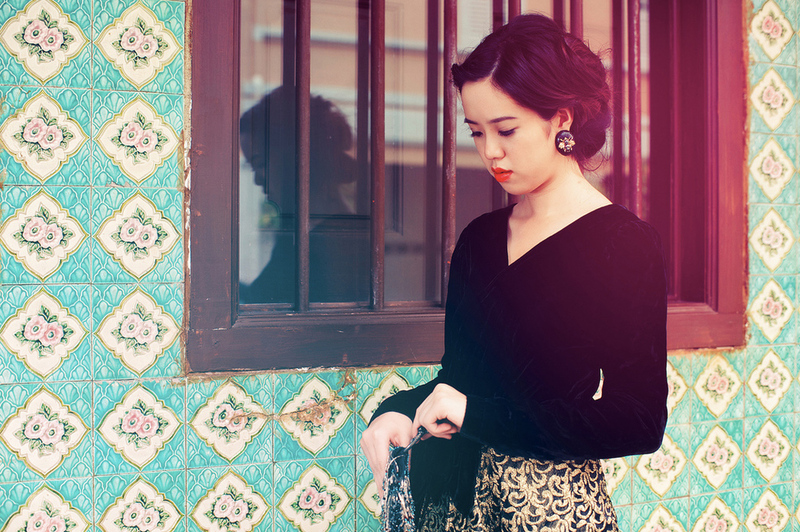 Many of your pieces are street shots that appear to be unposed. How do you capture them? Are the subjects aware that you’re taking their photos? How do they respond, if so? I rarely ever shoot autofocus, I almost always shoot manual focus. On most good lenses, there are little numbers printed around it which are measurements in feet and meters. If I turn the lens so the numbers align to 2 meters, that means anything 2 meters in front of me will be in focus. Then I walk around with my camera just above my hip, and shoot that way. I project a mental field before me, and anything that passes into that field is in focus. My subjects rarely notice me, I keep my distance and have a few tricks that make myself look like a dumb tourist fiddling with my camera. But in reality, I’m taking someone’s photo. If I’m caught, I just smile, introduce myself and say something friendly. Photography is a nice way to make friends and meet new people. I’ll show my subject the photo and they almost always laugh and smile. If someone is unhappy it’s usually because they notice they did not comb their hair right that day or their shirt looks wrinkled. I much prefer shooting before asking. I find that if I ask, they will pose, and the shot will lose that natural touch. Nope, never. I am definitely open to the idea, though. I have been commissioned for commercial projects in the past, mostly for tourism magazines, band photography or posters. If anyone wants to commission me, I can be reached through my website, Flickr, Twitter or Facebook. I love doing shoots for bands and musicians. And commissioning my work would preferably start with a dialogue over a coffee or a cocktail! I am always happy to sell prints of shots on my Flickr stream. They can write to me online and I'll work with one of the local printers here in Singapore to have it printed. I can also have it framed here, if they want. It depends on where it’s going to hang, and the subject of the photo. For abstracts, nature and landscape, I like big, epic frames. I especially like this for black and white prints. Tiny frames make these kind of shots feel insignificant, unless they are placed on a massive wall with nothing else nearby to interrupt it. For intimate photos of people and street, I like frames that are unintrusive and simple, no embellishments. I do not really see myself as a frame snob, I’m happy anytime someone wants to frame my work, no matter how they do it! My wife and I do very different things for work. She doesn’t work in the creative industry like I do, but she is a creative person, so I like to encourage her to make art as well. I love it when she takes an art class and comes home with a lovely painting. I think it makes a beautiful bond that brings a family together. That art not only adds a lot of character to your home, but gives your visiting guests a little more insight into your lives and personalities when they see our work in our home. My father does the same thing: he frames his and my mother’s photography and paintings and hangs them around our house. It always makes me and our guests smile to see it. I think that’s important.